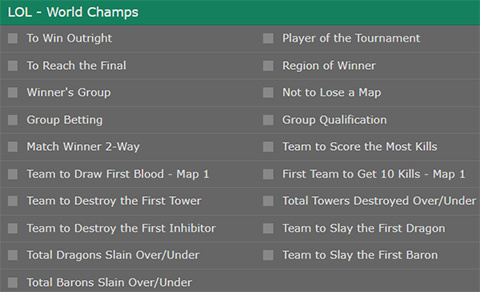 The official League of Legends World Championship 2017 will start on 5th October with Group Stage #1 and the bookmakers have already prepared a wide range of bets for you. We would like to introduce you to the three special bets that are solely aimed at the Group Stage: Winner's group, Group Qualification and Group Betting. 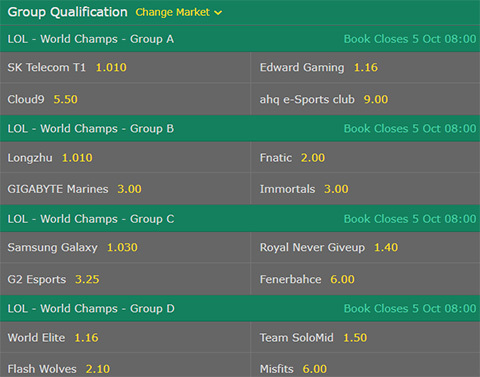 In addition to these three options, there are of course many other odds, you can bet on the individual games of the Group Stage and Knockout Stage as well as on the Outright Winner of LoL Worlds 2017, be aware the LoL odds can change over time, so you should check your bookie's website if you want to be up to date. If you don't have a betting account yet but would like to bet on the LoL Worlds 2017, then you should check out our E-Sports Bookmaker Overview. There is also the possibility to bet without real money at the Pick' Em challenge for the 2017 LoL Worlds. Here is a short overview of the bets on the LoL Worlds 2017. If you want to read more about the betting options “Outright Winner”,”To Reach the Final”, etc., come and see our Overview of the Betting Odds of the LoL Worlds 2017. After the draw of the groups has already been made, there are already odds on which group the later winners will come from. Of course, Group A and Group B are clear favourites, as they contain Longzhu Gaming and SK Telecom T1, while Group D has an outsider role and the best teams are Team SoloMid and Team WE. The Group Qualification option is about which team gets the Knockout Stage. A loss of the Korean teams in the Group Stage is almost impossible, but the fight for second seed of Group B and D is very exciting. 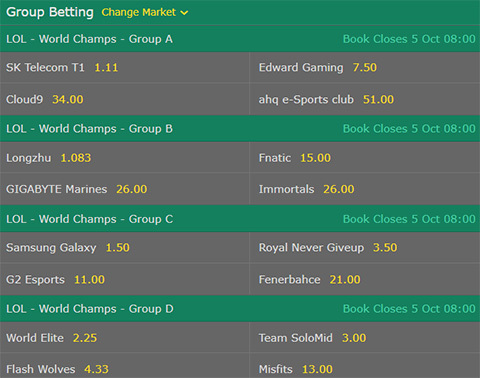 Group LoL Worlds 2017 Betting odds are similar to those of Group Qualification, but you can now take a higher risk. In this case, you have to bet on which team will be the winner of the respective group. In Group D, the odds are the most even although Team WE is slightly favored. An overview of all singel groups can be found at our Group A | Group B | Group C | Group D subsites. So far we've dealt with bets that have to be made before the first matchday. However, there is also live betting for all matches, which means you can bet on a team while the match is already in progress. So far there is only the possibility to bet on the winner of the game live, all other bets like “First Blood” or “Most Kills” will be closed at the beginning of the game. You also have to be quick to place a live bet, because as soon as something happens that could affect the outcome of the game (teamfight starts, champion gets killed, tower gets destroyed,…) the bet is suspended for a moment and recalculated. The bookmakers are often overly cautious and quickly attribute the victory to a team that has gained a reasonable advantage. If the odds for the underdog after a fight or a lost tower increase dramatically, you should consider betting on this team right then, as the betting odds probably don't reflect the realistic odds 1:1. A big advantage of the live betting system is that you can drop them off immediately after the draft phase without having different odds than before. So if you see a team composition as clearly stronger, you should bet on them right away.